Some new tools will be introduced in this tutorial for dealing with nonlinear relationships between a single numeric response variable and a single numeric explanatory variable. In most cases, this involves finding some way to transform one or both of the variables to make the relationship linear. Thereafter, the methods follow those of Simple Linear Correlation and Regression. You might want to review that tutorial first if you are not comfortable with those methods. Although it isn't strictly necessary at this time, as regression problems become more complex, it will become increasingly necessary for you to read the Model Formulae tutorial, as the model to be fit and tested by R will have to be specified by a model formula. You can probably skip it for now, but you'll have to read it if you go any further than this. planets = read.table(header=T, row.name=1, text="
The row.names=1 option should put the column labeled "planet" (the 1st column) into the row names of our data frame. Thus, we have two numeric variables: dist(ance) from the sun in millions of kilometers, orbital period in earth days. I'm going to begin with a suggestion, which is to convert everything to units of earth orbits. Thus, the units of distance will become AUs, and the units of period will become earth years. Now a nice scatterplot is in order. In the scatter.smooth() function, "span=" sets a loess smoothing parameter, "pch=" sets the point character for the plot (16 = filled circles), "cex=" sets the size of the points (6/10ths of default), and "las=1" turns the numbers on the axis to a horizontal orientation. We can see that the loess line is a bit lumpy, as loess lines often are, but it is definitely not linear. An accelerating curve such as this one suggests either an exponential relationship or a power relationship. To get the first, we would log transform the response variable. To get the second, we would log transform both variables. Let's try that and see if either one gives us a linear relationship. I'm gonna go out on a limb here and guess that the exponential relationship is not the one we want. The shape of that curve suggests that we need an additional log transform of the explanatory variable, which is what we have with the power function. The power relationship looks pretty much linear. Let's go with that. The residuals are virtually zero, as is the intercept, and R-squared is 1. I'm guessing we've nailed this, but let's take a look at a residual plot to see if we have left any curvilinear trend unaccounted for. Exponentiating and squaring both sides brings us to the conclusion that the square of the orbital period (in earth years) is equal to the cube of the mean solar distance (actually, semi-major axis of the orbit, in AUs). Had we left the measurements in their original units, we'd also have constants of proportionality to deal with, but all things considered, I think we've done a sterling job of replicating Kepler's third law, and in under an hour as well. 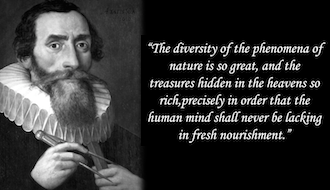 If only Johannes had had access to R! Notice in the last problem the relationship between the response and explanatory variables was not linear, but it was monotonic. Such accelerating and decelerating curves suggest logarithmic transforms of one or the other or both variables. Relationships that are nonmonotonic have to be modeled differently. The following data are from Fernandez-Juricic, et al. (2003). The data were estimated from a scatterplot presented in the article so is not exactly the same data the researchers analyzed but is close enough to show the same effects. We will model this relationship with a polynomial regression equation, and I would say from looking at the scatterplot that the equation ought to, at least initially, include a cubic term. 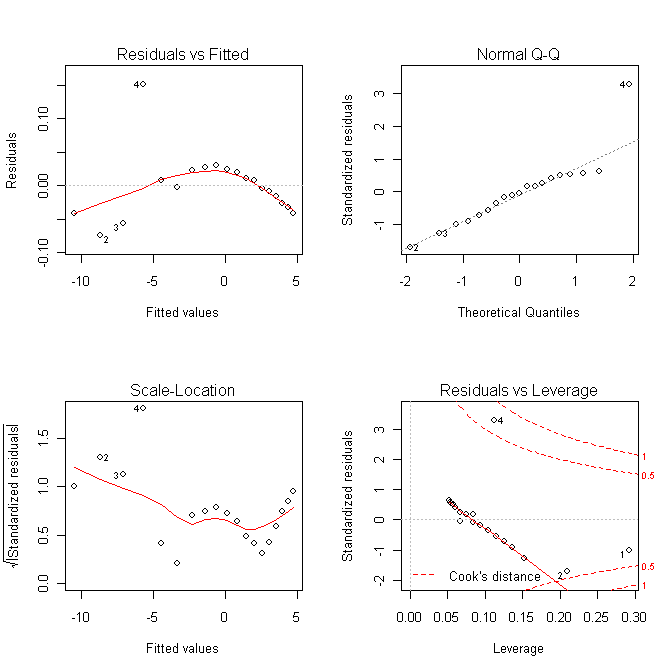 Provided the graphics device is still open with the scatterplot showing, we can plot the regression curve on it as follows (the red line in the graph above). Notice that the regression line picks up that last point better than the lowess line does. And therein lies a problem. I'm not going to go too far down this road, because it's a bumpy road. As a final comment I'll say that sometimes you have to go with what the phenomenon suggests rather than what the statistics suggest, and in this case the authors concluded that a quadratic model was most appropriate. They reasoned that, at first, as human activity increases, nesting activity also increases, because humans mean food. But when human activity gets too high, nesting activity is disrupted. Fernandez-Juricic, E., Sallent, A., Sanz, R., and Rodriguez-Prieto, I. (2003). 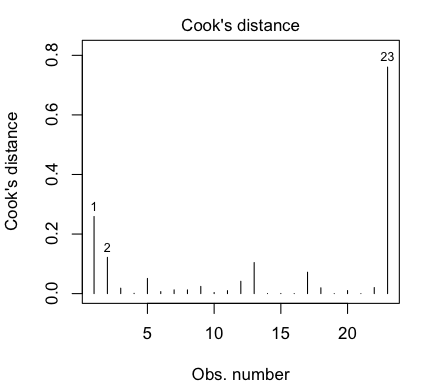 Testing the risk-disturbance hypothesis in a fragmented landscape: non-linear responses of house sparrows to humans. Condor, 105, 316-326. In this section we are going to use a data set called "pressure". The two variables are "temperature" in degrees Celsius, and the vapor "pressure" of mercury in millimeters of mercury. This built-in data set is derived from the Handbook of Chemistry and Physics, CRC Press (1973). A brief explanation may be in order for my less physical-science-oriented colleagues. When a liquid is placed in an evacuated, closed chamber (i.e., in a "vacuum"), it begins to evaporate. This vaporization will continue until the vapor and the liquid reach a dynamic equilibrium (the number of particles of liquid that go into the vapor is equal to the number of particles of vapor that go into the liquid). At this point, the pressure exerted by the vapor on the liquid is called the vapor pressure (or equilibrium vapor pressure) of the substance. Vapor pressure has a complex relationship with temperature, and so far as I know, there is no law in theory that specifies this relationship (at least not in the case of mercury). Since we are dealing with a liquid/vapor phase transition, and not just a gas, the simple gas laws you learned back in high school chemistry don't apply. The vapor pressure of mercury and its relationship to temperature has been an important question, for example, in the calibration of scientific instruments such as mercury thermometers and barometers. These are linear transformations and will not affect the nature of any relationship we might find. Now, it annoys me to have to type something like pressure$pressure, so I would like to attach this data frame. But that produces an annoying warning of a conflict, because one of the variables in the data frame has the same name as the data frame. So, we will extract the variables from the data frame, putting them in the workspace with more "typeable" names. This will make it unnecessary to reference the data frame, and yet if we get careless and mess something up, we still have the data frame as a backup. And we are finally ready to go. We begin, as always, with a scatterplot. When I see something like that (leftmost graph), I immediately think "exponential relationship," so a log(y) transform might be in order. 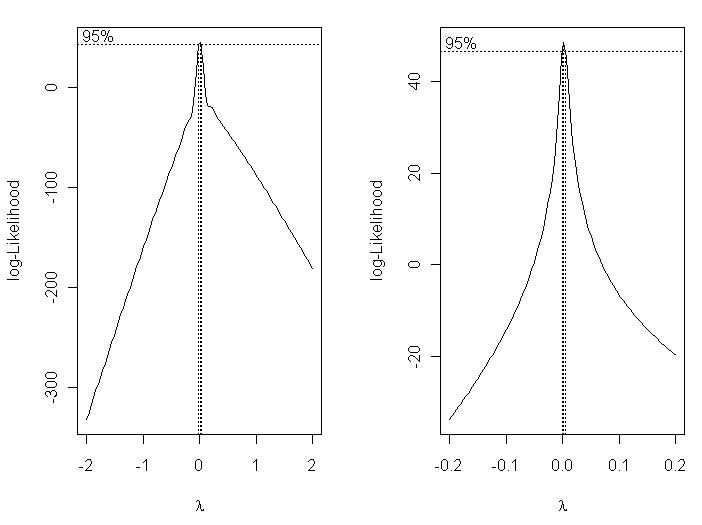 This can be done in two ways: by actually transforming the variable to create a new variable by logpres=log(pres), or by having R plot the relationship with a logarithmic axis. No (second graph), that appears to have overcorrected. So let's try a power function (log(y) and log(x) transforms). That (third graph) appears to be a little closer but still a bit bowed. 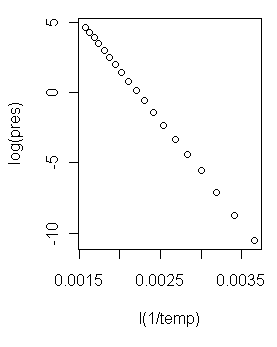 A log(x) transform (last graph) is silly but illustrated just to show it. Although we know it's wrong from the scatterplots, let's fit linear models to the exponential and power transforms just to illustrate the process. 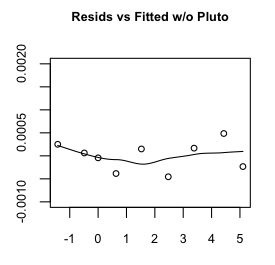 The residual plots show a clear nonrandom pattern, betraying the fact that we have the wrong models here. We have missed a substantial amount of the curvilinear relationship. 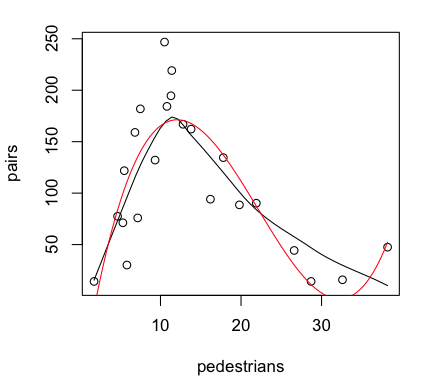 A polynomial of sufficient order will fit any scatterplot perfectly. If the order of the polynomial is one less than the number of points to be fitted, the fit will be perfect. However, it will certainly not be useful or have any explanatory power. Let's see what we can do with lower order polynomials. A glance at the scatterplot is enough to convince me that this is not a parabola, so let's start with a third order polynomial. 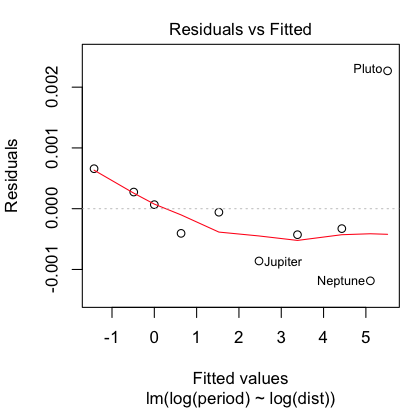 "lm.out1"  "lm.out2"  "pres"     "pressure" "temp"
All three estimated coefficients are making a signficant contribution to the fit (and the intercept is significantly different from zero as well), and any social scientist would be impressed by an R2-adjusted of 0.987, but the residual plot shows we do not have the right model. To see why, do this. When you get desperate enough to find an answer, you'll eventually start reading the literature! An article I found from Industrial & Engineering Chemistry Reseach (Huber et al., 2006, Ind. Eng. Chem. Res., 45 (21), 7351-7361) suggested to me that a reciprocal transform of the temperature might be worth a try. Box-Cox transformations allow us to find an optimum transformation of the response variable using maximum-likelihood methods. The plots suggest we adopt a lambda value very close to zero, which is to say, we should use a log transform of the response variable. Now that is a scatterplot I can live with! (At right.) On with the modeling! I'd say we might be on to something here! 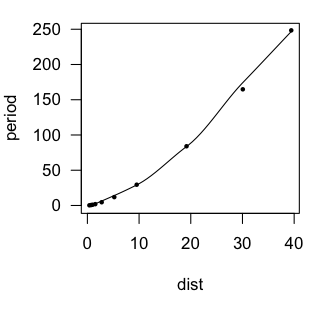 It appears we have a model regression equation as follows. ...suggests we are still not dead-bang right on, but we are awfully gosh darn close! It might be profitable to toss out case 4 and try again. 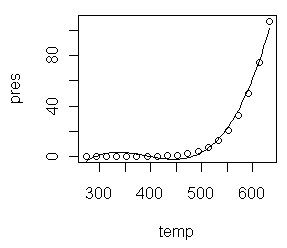 ...and now we will make predictions from our model for those tabled values of temperature. The first thing you feed the predict() function is the name of the model object in which you've stored your model. Then give it a list of vectors of new values for the explanatory variable(s) in the format you see above. The output is not pressure in kPa, because that is not what was on the left side of our model formula. The output is log(pres) values. To get them back to actual pressures, we have take the natural antilog of them.